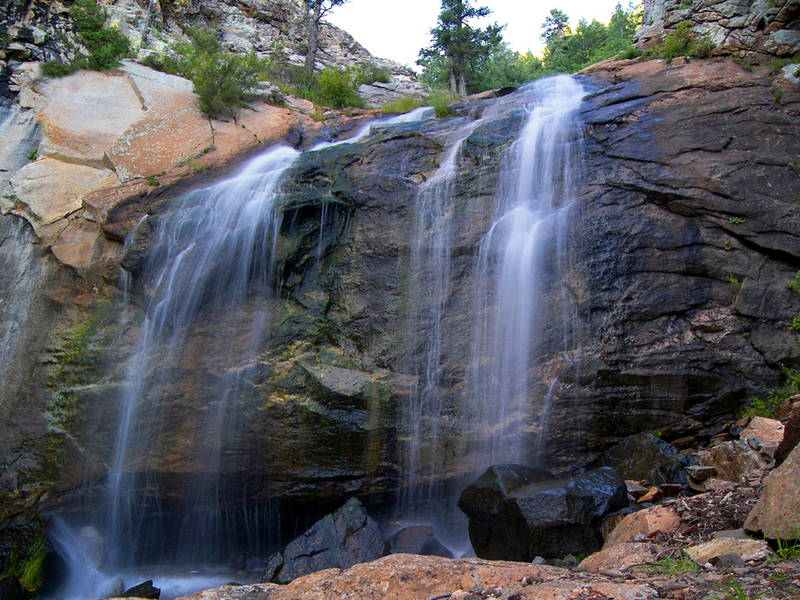 Overview: This combination trail hike and bushwhack leads to a small thirty foot waterfall below Treasure Park, where perennial Big Creek tumbles off the southern edge of the Pinaleno Mountains. Warning: The final approach to Big Creek Falls requires scrambling above cliffs on steep, brush covered slopes. Be cautious and choose your route carefully: in some places, a slip could result in serious injury or death. Take note of your surroundings on the hike in, as there is only one way in and out of the falls area. Hike: The hike begins at a hairpin curve and creek crossing on the south end of the Treasure Park loop road (forest road 89). Follow the faint use trail that heads south, down the west bank of Treasure Creek. Within a few hundred feet, the faint trail becomes a worn and definite path that enters a nice stand of spruce and fir along the edge of Treasure Creek. Within a quarter of a mile, the forest gives way to an open, grassy park, where Treasure Creek joins Big Creek. A large cairn near the confluence marks the junction with a spur trail leading up Big Creek to the Hospital Flat Nature Trail. Continue down canyon on the main trail, which follows Big Creek. 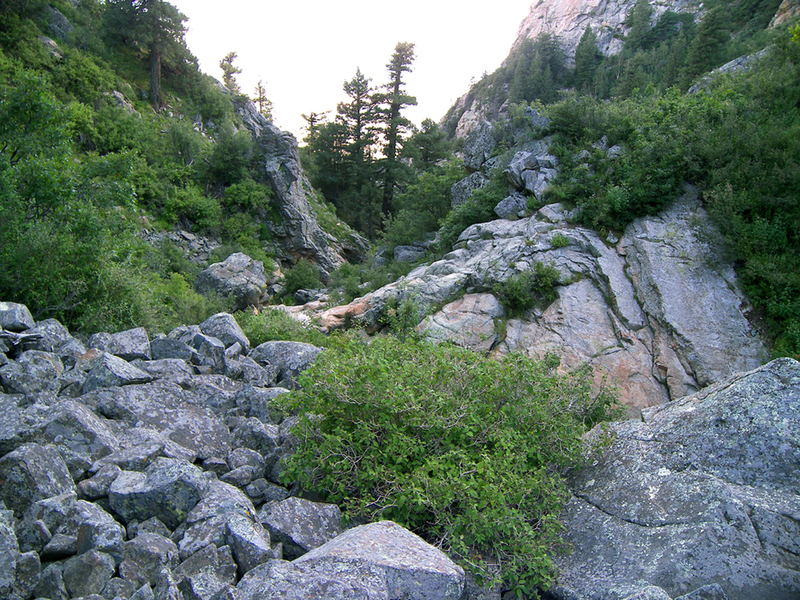 At around 0.5 miles, exposed bedrock and a series of small cascades signal the edge of the mountain, while the footpath comes to a sudden end at a rockslide near the creek's edge. From the trail's end, continue along the east side of the canyon for a couple of hundred feet, above the creek, until an outcrop of rock forces you up the east slope. A climb of one hundred feet or so will bring you above the impassable outcrop, thus allowing you to contour a short distance to the south, where you will find a slope covered in scrubby, gambel oak saplings. Descend this slope, which shortly pinches down to a narrow, rocky overlook, on the edge of Big Creek canyon's wonderfully rugged abyss. Aspens with names carved in them help identify the site. Out of the mouth of the V-shaped gorge is a fine view of Sulphur Springs Valley. On the north (upstream) side of the overlook, a precarious footpath descends about fifty feet to the base of now visible Big Creek Falls. A small, level slab of metamorphic bedrock at the base of the falls provides an ideal place to relax and enjoy Big Creek's little gem. This rugged spot is the end of the line for hikers. From Safford, head south on U.S. highway 191. Turn west onto state highway 366 (Swift Trail). Follow highway 366 for approximately 22.6 miles to the signed Treasure Park turnoff, at milepost 137. Turn left at the sign and follow the campground road (forest road 89) for 0.4 miles to a hairpin curve where the road crosses a creek. There is parking available along the spur road that takes off to the right. The unmarked and faint trail follows the creek downstream (see description above).